Improve productivity with collaboration of AI and people. Just drop a file to start. Each sentence gets analyzed to build the optimal translation. YarakuZen's start screen is a minimal Zen-style design. Machine translation starts when you drop your file you want to translate* (and select the language). 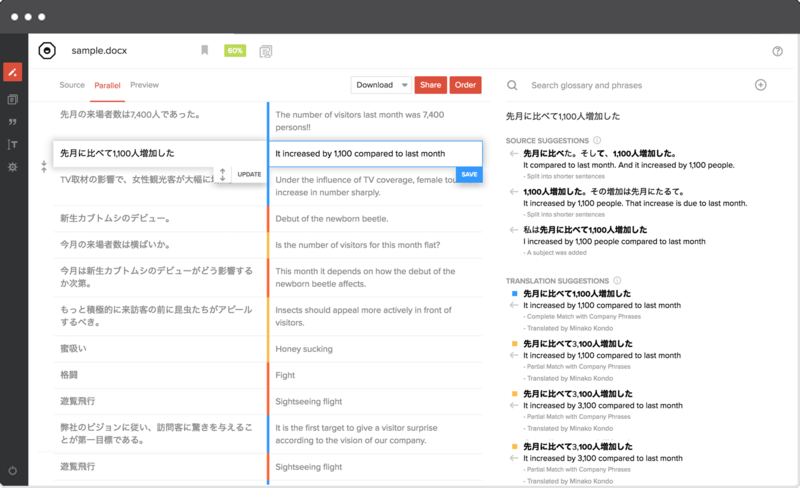 During the machine translation process, YarakuZen extracts text from the file and segments them into sentences. 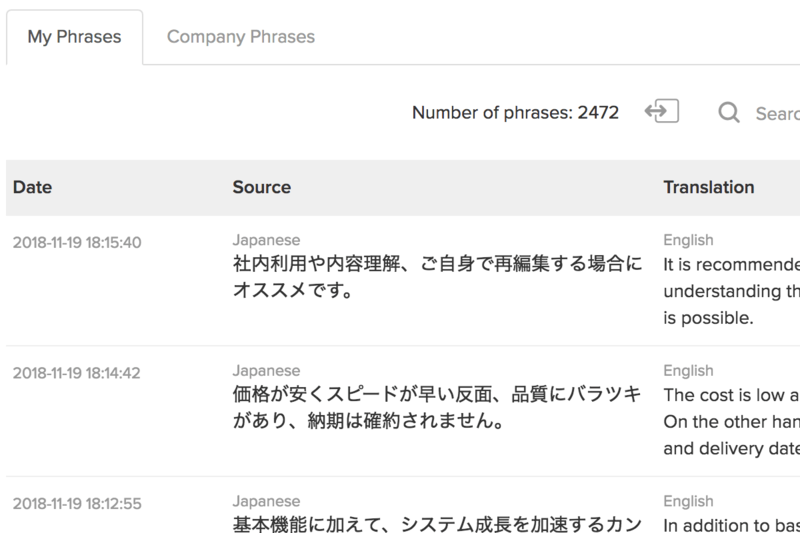 Then, it matches each user's translation database of "Phrases" and "Glossary", and generates the optimum translation based on the matching rate for each sentence. * Supported formats are Word, Excel, PowerPoint, PDF, CSV, HTML, and text input. In addition, you can use our integrations like API, WordPress plugin, etc. For details of supported formats, please click here. If you translate phrases that completely match a phrase you have saved in YarakuZen before, then the past translation will be displayed. Edit Machine Translation while keeping the look. No troublesome file editing is necessary. Edit the text after machine translation. You can download the translated document in it's the original layout. 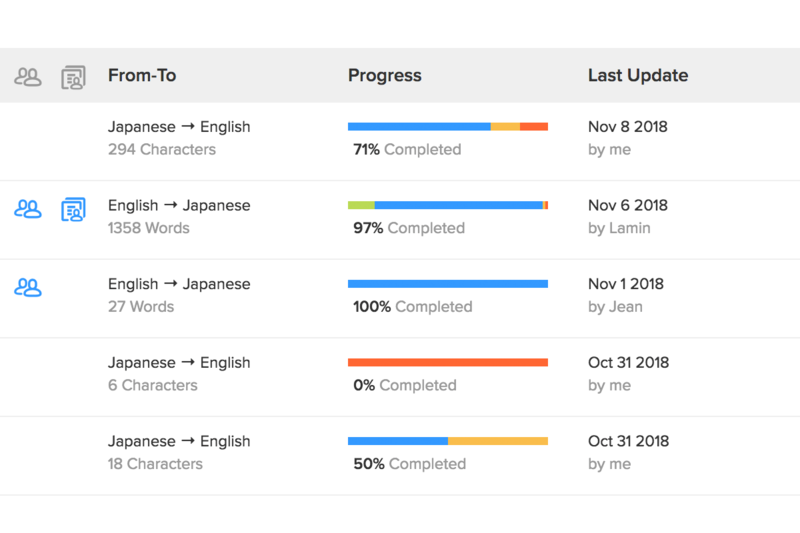 With machine translation and automatic file processing in YarakuZen, translation speeds dramatically improve compared to working from scratch. There are three ways to edit: "Edit by yourself", "Order", and "Request to translation manager". Translate by referring to example sentences, dictionaries and machine translation on the right panel. *1 Rates vary depending on language and plan. Please check here for details. *2 "Share" is a function of Company Plan. Check translation status at a glance. 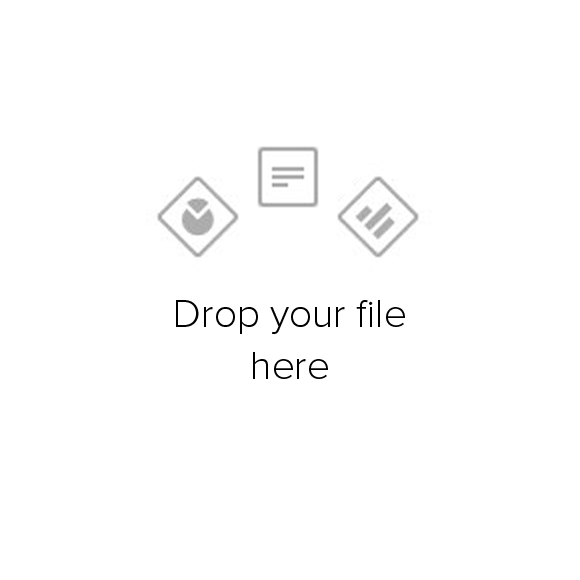 Share frequently used documents as templates. 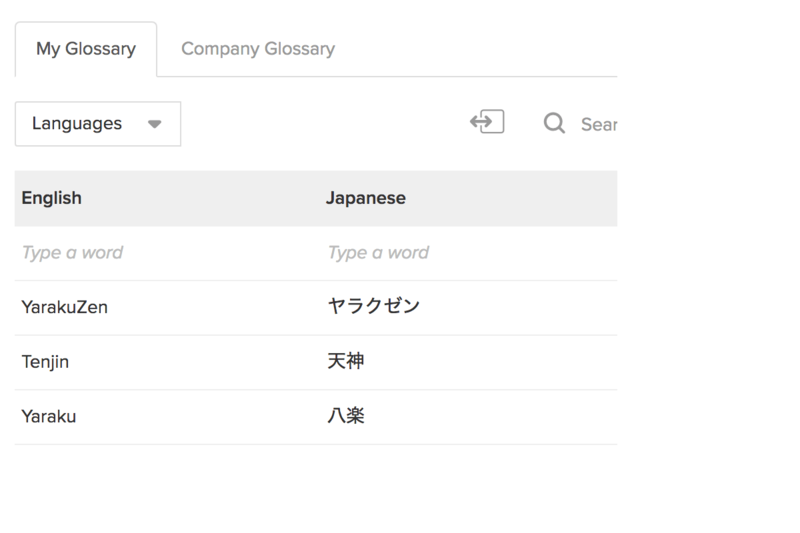 You can centrally manage past translation documents in the Document page. 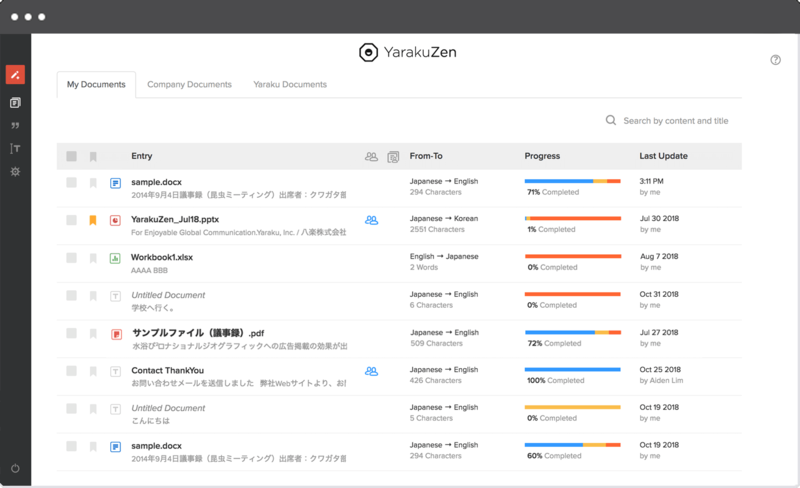 There are three types of translation documents, "My Documents", "Company Documents", and "Yaraku Documents". This is a document shared by translation manager. You can use them as an in-house template such as contracts, IR materials, mail templates and so on. 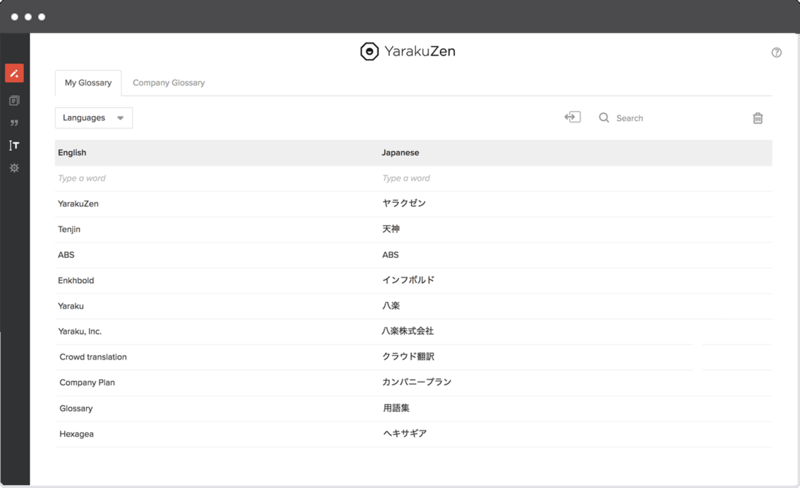 A collection of templates available to all users of YarakuZen. You can use them for general business e-mails, restaurant menu, meeting minutes, and more. *1 Document sharing is a feature in Company Plan. *2 Company Documents feature is available in Company Plan. The more you save, the better the translations. Modified text can be saved in "Phrases" and used for subsequent Machine Translation. 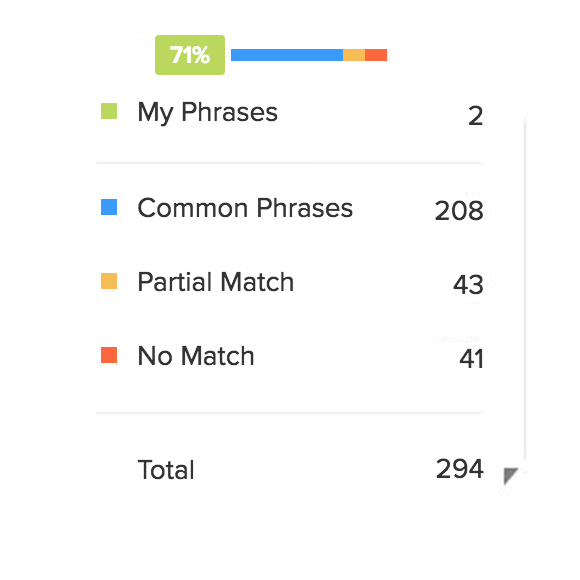 Phrases has "My Phrases" and "Company Phrases". These are translation sentences you have edited. These are translations edited by a translation manager. They are shared with company members and have priority of application over My Phrases. * Company Phrases feature is available in Company Plan. Be free of tiring spreadsheet management. The terms registered are automatically applied in machine translation. By registering internal terms, industry terms, technical terms and other specialized terminology, you can prevent translation fluctuation. This eliminates the need for traditional spreadsheet management and saves you time in searching for terms. Glossary consists of "My Glossary" and "Company Glossary ". These are terms that you have registered. These are terms registered by a translation manager. They are shared within your company and have priority over terms in My Glossary. * Company Glossary is available in Company Plan.